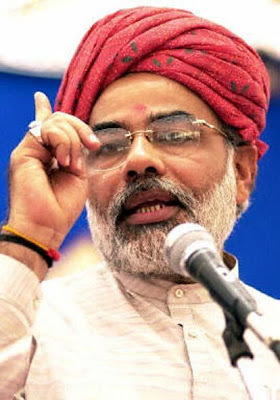 Random Thoughts: Arrest me if you have the guts, Modi tells PM !!! Arrest me if you have the guts, Modi tells PM !!! "Arrest me if you have the guts, Modi tells PM". A really sensitive heading posted by rediff. The count-down to the recent Gujarat polls is really going past in an interesting and curious manner. With the centre poking its nose in the state, trying to ensure that the existing government is not returned back to power; with a vehement Chief Minister (whom a Gujarati tells me, runs the state like a corporate undertaking with video conferencing on updates from district administration everyday) who is not afraid to speak his heart-out; and with an eager and closely monitoring Election Commission, this tripartite affair is really getting interesting. For long now the Congress has been accused or having a puppet time in the Indian Government with the show being essentially run by just one (though I do not agree with it, especially as far as the financial and taxation sector is concerned) and no wonder majority of Modi's comments have come against that one person (no marks for guessing whom, ok ???) But this is probably the first time that he has spoken against the PM himself. Mostly soft-spoken but a genius, Dr. Singh has never been a political person throughout. He has been serving the country with the very best of himself and the best of his legions against all odds but then the thing is that politics is not all about efficiency (though I would seriously love that too be) and there is a bit of politics in politics (for the rest bit of it, I decline to recognize it for it is essentially the manifestation of corruption and vagaries of power). And therefore more needs to be done in order to take care of purely political issues, atleast I think, on Dr. PM's part. I would surely not be surprised if there are no reactions or comments either from Dr. Singh or the PMO on this challenging remark by Mr. Modi but then surely there would be one from the Election Commission, which is poorly placed in between the centre and the state. Notices would be issued and proceedings initiated, the results would be withheld till the line-up for the elections is complete and new government comes to power. A typical Indian case. So much from the politically sensitive country. But as for Gujarat, the state is really progressive and that there is no second thoughts on that.